Originally published as Secret Histories in 2004, the book was first written under the pseudonym John Murray. Republished a year later, a pseudonym was again used to protect both the author and the people with whom she interacts. What is known about the author is that she was born and raised in Asia, is fluent in Burmese and first visited Myanmar in 1995. Having covered Myanmar in her role as journalist for a considerable number of years, Larkin's extensive knowledge of the country, its people and the oppressive military junta that has ruled it since independence in 1962, has been very much brought to the fore when writing this book. What is also probably unknown to most people who haven't studied George Orwell, is that he used a pseudonym himself and only adopted his pen name after returning to England following five years he spent in Myanmar during the 1920's working as an Officer in the Indian Imperial Police. Burma played a significant part in Orwell's life as he matured into adulthood and one of his very earliest novels, Burmese Days, was based on his experiences in the country. On his death bed he also had composed a rough outline sketch of a novella, that again would be based in Burma. However, it is for the novels Animal Farm and 1984, that George Orwell will always be best known. Larkin adroitly combines all three of these books and classifies them as a trilogy and from here is able to draw parallels to the military junta of Burma and the abuses of power that sadly describes the modern history of Myanmar. 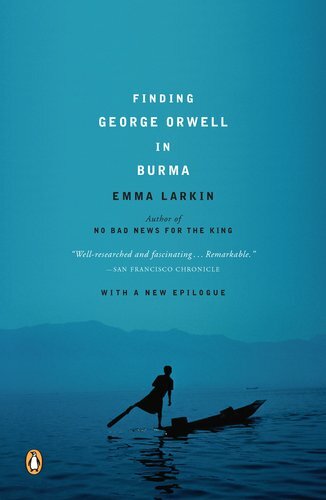 Finding George Orwell in Burma concentrates mostly on the conversations that Larkin has with people in places she visits, rather than on physical surroundings. This enables here to draw attention to the lives of ordinary citizens having to live under the oppressive regime. Additionally, she also is able to impart a good amount of information about Orwell himself and his life in Burma as she travels through the country. Since Larkin wrote her book considerable progress on humans rights issues have been made within Myanmar. In 2011 the military junta was officially dissolved and in 2015 the country held, and more importantly, were also able to implement a government based on what were free elections. The landslide victory saw Aung San Suu Kyi elected as the de facto head of government by being appointed to the newly created office of State Counsellor of Myanmar due to her being constitutionally barred from being elected President. Unfortunately, at the time of writing this review, Myanmar is again embroiled in human rights abuses towards its ethnic minorities, as the military takes revenge for insurgent attacks on police and paramilitary posts. As a result, nearly 400,000 Rohingya Muslims have fled the Rakhine state into Bangladesh. That Larkin makes mention of the cultural genocide taking place in Arakan State (the former name for Rakhine state) towards the Rohingya who "bear the brunt" of the regime's racial hegemony, illustrates how long persecution has been ongoing. Aung San Suu Kyi claims that the crisis in Rakhine state is being distorted by a "huge iceberg of misinformation" on the face of it seems woefully inadequate from someone who alongside Nelson Mandela was viewed as one of the most important global symbols of defiance against tyranny. Whilst there definitely has been a large amount of “fake news” surrounding this issue, a lot of this is due to Suu Kyi’s government continuing to restrict access to areas of conflict, where mostly ethnic minorities reside. Whilst it is clear that Suu Kyi does not control the military, her refusal to condemn well-documented military abuses provides the generals with necessary political cover. Whether her refusal is due to fear that any condemnation might prompt the former junta into retaking full control of Myanmar once again, is unknown. What is known, is that this is a complex issue, and the world can ill-afford to once again do nothing and stand on the sidelines as another genocide event potentially unfolds. Larkin's book provides us with a better understanding of what life was like for those people who were living under the military regime in the early 2000's. Whilst it is well written, the same messages and comparisons tend to be repeated which makes it feel somewhat short on content, even though the book itself is a relatively short read. All up, Finding George Orwell in Burma is a cleverly composed, good read which brings attention to some serious human rights issues, that is every more important in light of current events.